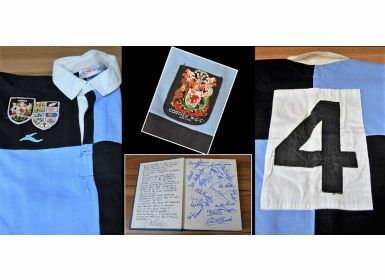 Rare 1976 Cardiff RFC v World XV Rugby Jersey and Signed Book (2): matchworn No. 4 Jersey from Cardiff's Centenary year game against a World XV. Crisp bright blue and black special quartered jersey with Cardiff crest and the special intricate shield with badges of the World XV's countries: these were given to players for sewing on later! Excellent condition. Also, gathered with forethought, as explained on the inside cover of Danny Davies' hardback volume 'The Greatest', Cardiff RFC 1876-1975, the neat clear signatures of all the players on both sides (though two had to be provided later). Therefore likely to be unique, and along with the jersey a striking reminder of the celebrations of one of the world's leading rugby clubs. VG and highly collectable.